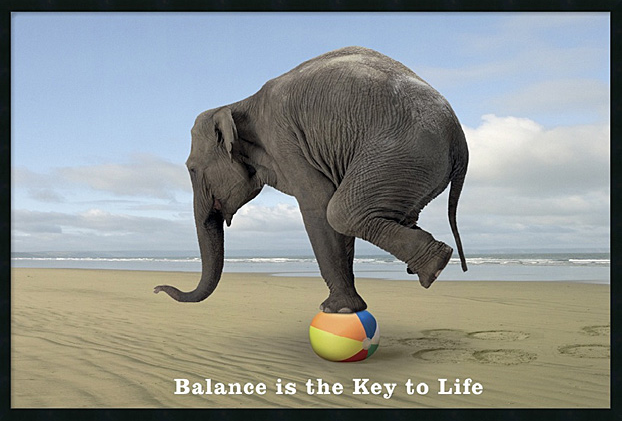 Balancing Act…this elephant has crazy core stability! The past few weeks have served as a bit of a break from active writing (I define ‘active writing’ as writing every day for a couple of hours about art.). Wanting to take a step back and re-focus is the primary goal at the moment. There’s always something that brings me back to art though. It’s in everything I do. The practice of posting to my blog everyday in 2011 (at the very least, gathering material to post for every day of the year) taught me a lot about producing well written and researched content. However, after a year of that practice, I found myself wanting to write ALL the time and feeling guilty when I find myself unable to produce. THIS was a sure sign that I needed to step back. Aside from wanting to constantly write about the things I want to write about, I have to balance deadlines and exhibition reviews for different editors too. “…And don’t worry about losing. If it is right, it happens – The main thing is not to hurry. Nothing good gets away”. It’s OK to not write about EVERYTHING I see! Posted in Art Writing and Criticism and tagged as art writing, art writing process, writing practice. You’re insights are worthy of playback, as auto-suggestions to hear at the brink of sleep. I’m glad that you’ve had a wonderful refresher, and things to cushion you from the ‘slings & arrows’ of insanity. Other ways to step back from work? I’m afraid in my case it’s the opposite. Last week a mover just told me, “There’s a lot of nice art here in San Francisco.” I was taken aback, and asked him to repeat that. I wished then that he was telling YOU that instead of me. Ha ha. Yeah, I had to post this before I went to sleep last night. As I mentioned in my comment to Michelle, sleep and relaxation is so important. I’m not 23 years old anymore and I have to be very mindful of my time BUT I also have to engage in activities that help me take a step back. Your suggestions, by the way, are not plebeian at all!! I have been playing with my cat more often. I see that she has a lot of energy so I TRY really hard to have her exercise. It actually hurts my feelings when people visit and comment on her girth! The nerve!! Then again, it means I need to make her run around a bit more. I definitely agree with finger painting. That actually sounds like fun. I am working on creative collaborations but they’re pretty cerebral. Fun but cerebral. I have been hitting up the sauna, actually. VERY relaxing! A few weeks ago a friend of mine posted an article to her Facebook page about making sleep a priority. (sorry, I can’t find it right now). But I this is something I’ve been focusing on – I tend to run myself ragged with work and home and art and openings and deadlines and friends…and then I tend to exhaust myself and get sick. So…I’ve been making sure I go to bed before midnight, and that means sometime sacrificing an activity, art making, deadlines, going to an opening, so be it. It’s just all part of accepting that I can’t do it all, and that I enjoy what I do much more – and I’m much better at it – when I get enough sleep! Thanks so much, Michelle! You brought up something that I, often times, forget is imperative to one’s success – sleep!! I would love to read that article. Lately, I have been sleeping A LOT better, which makes me incredibly happy. I’m so much more productive when I get in a great night’s sleep. As you mentioned, going to sleep at a regular time and sacrificing art making/creative activities is so important. Over the weekend, I was at a dinner with good friends and one of my friend’s suffered a major injury (falling from a ladder) from de-installing an exhibition! So, his partner came up with a great rule: If you are unable to put on and tie your shoes…you’re too tired and probably shouldn’t do something that requires a lot of energy. Sounds crazy BUT very true! Speaking of activities, I still want to visit your studio and take one of your workshops!! Thanks again for stopping by. Again, please feel free to share that FB article on sleep!! Thank you so much, Michelle! Great blog post on sleep. I’m equally fascinated by Haruki Murakami’s sleep schedule. I may opt for that type of schedule since I notice that the writing bug hits me pretty early as well. I also don’t mind sleeping earlier. It’s all about training the body, I guess. Again, thanks for sharing. I will definitly try and develop new strategies around sleep so I could make the most of my waking time engaged at work and with my art writing! !